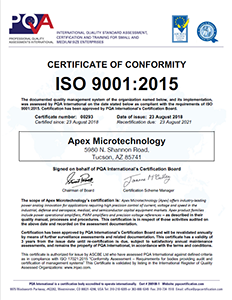 Apex Microtechnology’s Quality Policy is based on four core directives: Satisfy the Customer First; Provide Competitive Solutions to Customers; Comply with all Customer, Statutory and Regulatory Requirements; Measure and Improve Continually. This commitment is demonstrated through consistent improvements in Apex product quality and performance. 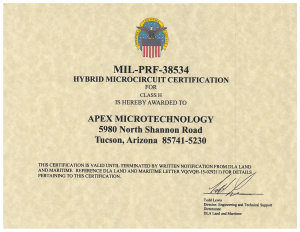 Please use the subject links below to learn more about the quality programs at Apex Microtechnology. Click on certificate below to download a PDF version.